The Ironbox model that is am using is Crompton Greaves (CG102). It is not a new model but an older model. My Iron box is little heavier as it is made of steel except the handle. I am using the Iron box for more than ten years. It was the fast moving model at the time it hit the market. The handle is Black in color which is made of a good plastic.It is designed in such a way that I can hold the Ironbox comfortably. The handle is mounted on a spring so that it can be removed. My Iron box gets hot very quickly within few seconds once the plug is inserted into the socket and the switch is put on. This helps me to save the time waiting unnecessarily for the Iron box to get hot. But i feel little difficulty while moving the Ironbox over the clothes as it is little heavy. There is a small circular type switch which is made of plastic. It is used to select the type of clothes that we are going to iron. There are various options like cotton,wool,nylon etc and the switch is rotated to the appropriate type.The wire is made up of a thick black and white coloured insulated material. There is an LED indicator which switches ON and OFF at regular intervals. When the light is ON, it indicates that the Iron box is receiving the power. When the light is OFF, it indicates that the Iron box had stopped receiving the power. This occurs when the Iron box has enough heat to iron the clothes. After sometime when the temperature reduces, the Ironbox starts receiving the power automatically. After the ironing is over i will allow around ten minutes for my Ironbox to cool. That time will be more than sufficient for it to reduce it's temperature. 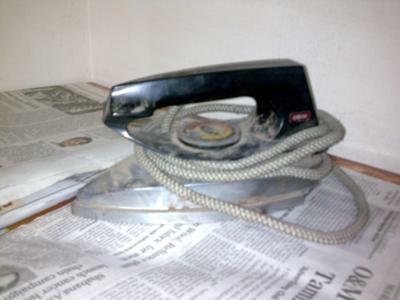 I use a table to iron so that i can handle my Ironbox easily. The specialty of this ironbox is its quality and its life. My iron box absorbs very little power. Though it is not in the market at present, it is one of the best appliance i ever purchased.